Sorrowing Hearts at Home Weeping Sad and Lonely, or When This Cruel War Is Over: Song with Chorus. 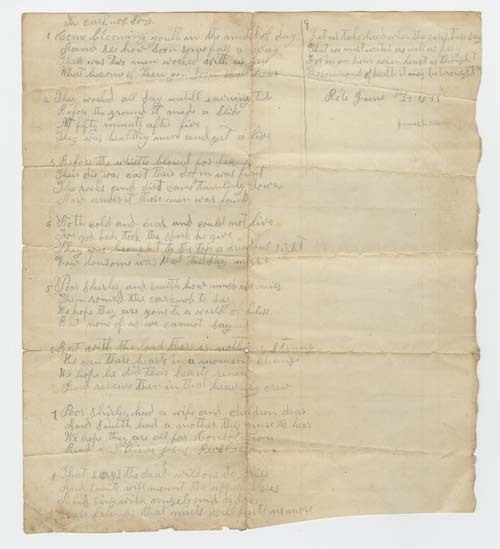 This manuscript sheet, attributed to Charles Stewart of Fayette County Pennsylvania, contains shape-note music and lyrics for "When This Cruel War Is Over" on ruled stationary. The front page is inscribed "August 24th 1867, Saturday half past" and "June 9th 1868." MUMSS-00136. CPM. For a more detailed description of this manuscript, click here. To view the full manuscript, click here. Manuscript Music Book Belonging to Wilson Boehm. 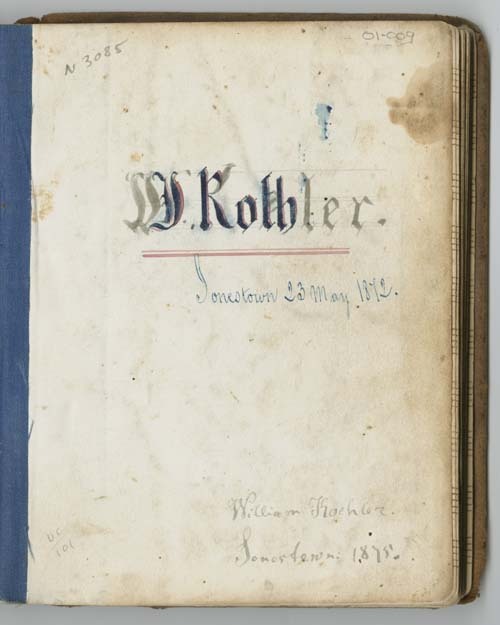 Wilson Boehm owned this copybook "manufactured and sold by Thos. R. Weber" in 1854. It contains the lyrics to several popular and sacred songs, some (as with the song pictured here) with shape-note music notation. One page in the volume features a school commencement program that includes addresses, recitations, and school exercises and songs. MUMSS-00131. CPM. 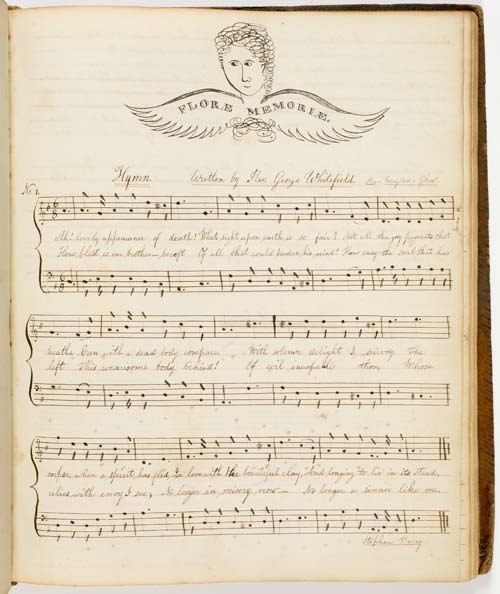 Manuscript Music Book Belonging to Mrs. Eliza Everett. This page comes from a calf-bound octavo volume inscribed "Presented to Mrs Eliza Everett Boston Janry 17th 1811" and "Samuel W. Everett. Jany. 24th 1838." The volume contains manuscript copies of 130 English, Scottish, and Irish jigs, reels, and music associated with the theater from the late 18th and early 19th centuries. 271480. AAS. 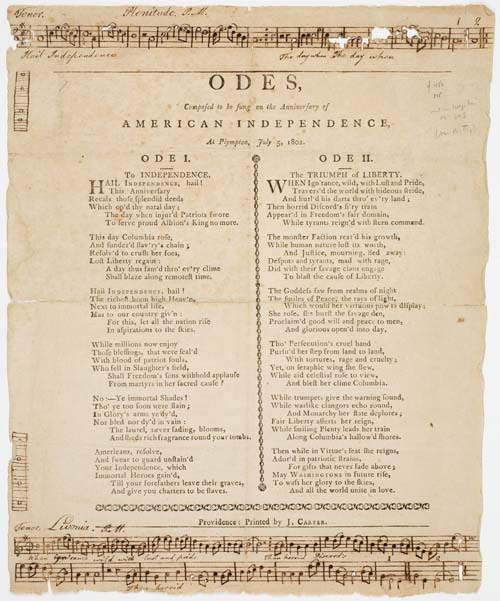 Manuscript Entries Included with Odes. This page is inscribed "Mr. Lewis Bradford" and includes two manuscript hymns added to a published page of odes. The original item was published by J. Carter of Providence, Rhode Island in 1802. 283401. AAS. 283401. CPM. Manuscript Music Book Belonging to Polly Elvira Bouchell. No. 1. 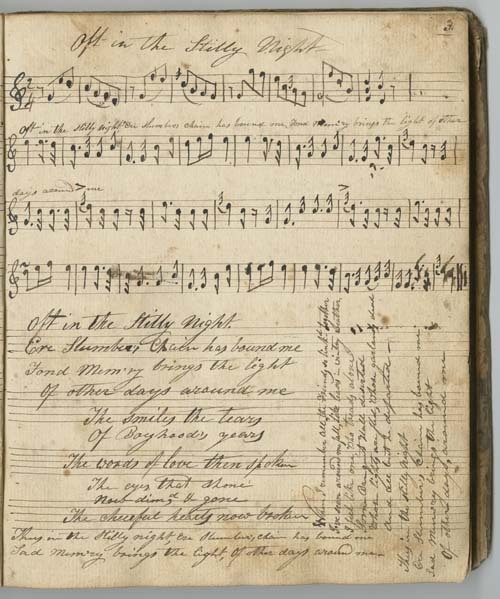 One of two manuscripts held by the Center for Popular Music that once belonged to Ms. Bouchell, this copybook contains 28 pieces including popular songs, hymns, and marches. Inscriptions on title page read, "Katherine A. Erwin" and "Polly Elvira Bouchell, Salem, North Carolina, July 18th 1811." 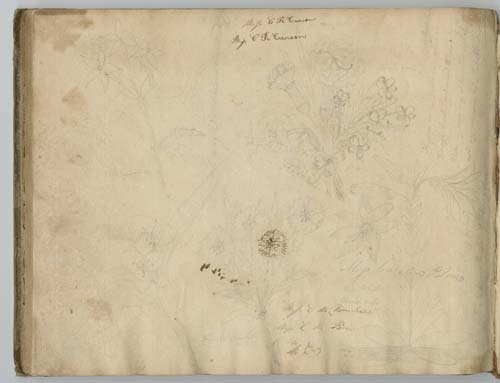 Several pages in both volumes, such as this one, include pencil illustrations of flowers or people. MUMSS-00028. CPM. Manuscript Music Book Belonging to Milton Barlow. This copybook is inscribed "Milton Barlow" and later "Problems by Thomas Barlow, June 13th 1829." The volume contains 125 marches, waltzes, hornpipes and other popular tunes such as "Oft in the Stilly Night," "Highland Mary," "Auld Lang Syne," and "Roslin Castle." Also included in the manuscript are several mathematical exercises beginning on page 59. MUMSS-00106. CPM. 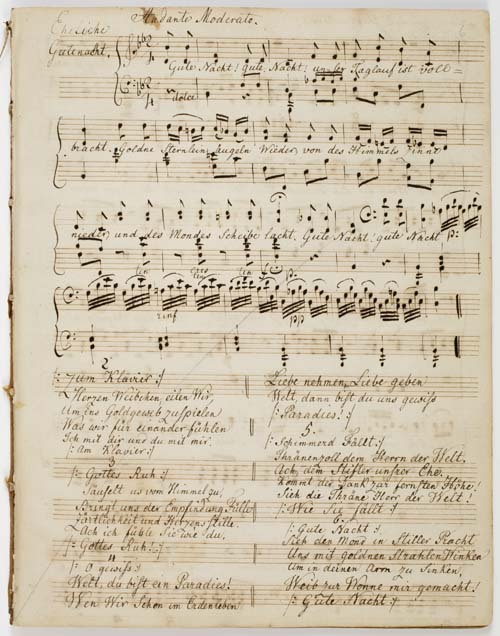 Manuscript Music Book Belonging to I. Roth. From Jonestown, Pennsylvania, this manuscript music book with calfskin covers includes 99 marches, quicksteps, waltzes, and patriotic songs. From the title page pictured here, we can tell that the book changed ownership at some point. The original inscription, in blue ink, reads "I. Roth. Jonestown 23 May 1872." Roth's inscription was subsequently altered by another owner, "W. Koehler." Differences in the ink that the two scribes used within the volume also show where Roth stopped adding pieces and Koehler began. MUMSS-00113. CPM. 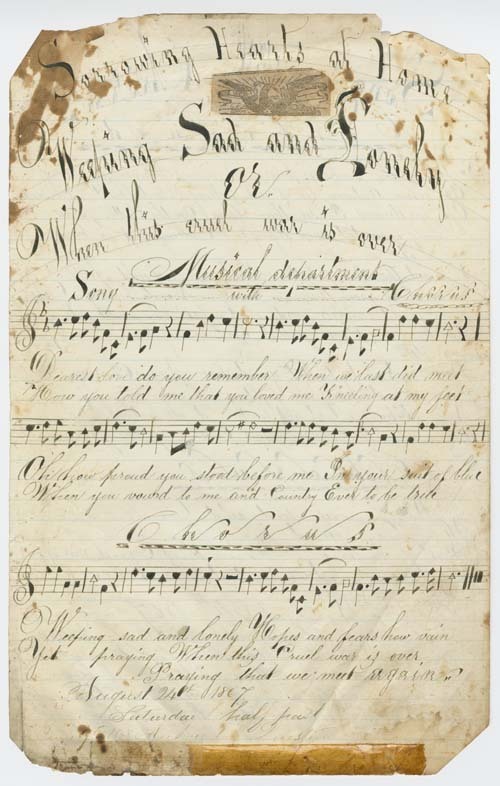 Manuscript Music Book Belonging to Charles Sanderson. 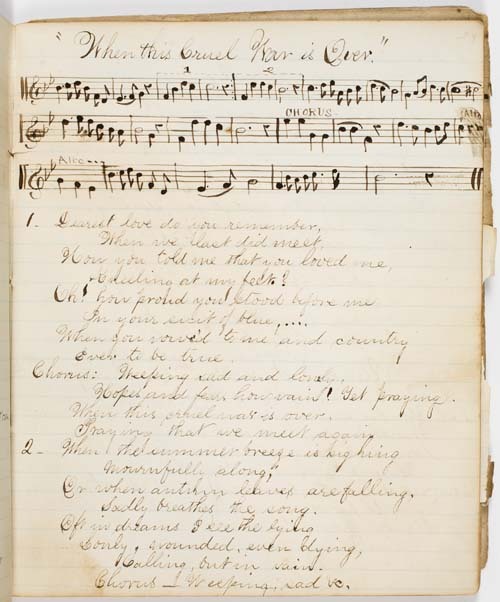 This song book, dated December 29th, 1866, contains handwritten music and lyrics. Songs in this volume focus on the Civil War, and include titles such as "When Johnny Comes Marching Home," "O Wrap the Flag Around Me, Boys," "The Vacant Chair," and "The Dying Soldier." 505818. AAS. Eheliche Gutenacht. This collection of 65 pieces in German and English was originally part of a larger musical copybook that has been disbound. Unfortunately, the item has no annotations or identifying information that would hint to the provenance of the item beyond the music itself. However, differences in penmanship seem to indicate that more than one person contributed songs to this volume. 479487_fovol05. AAS. 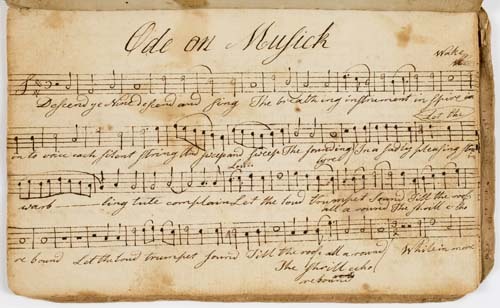 Manuscript Music Book Belonging to Susanna Perkins. 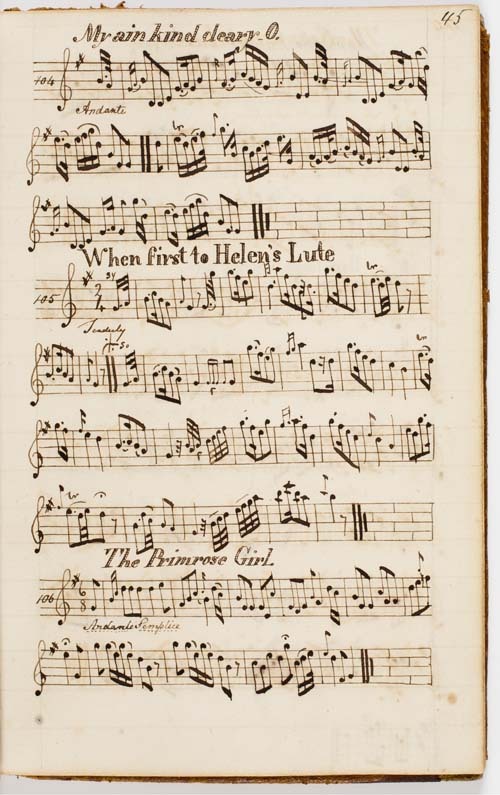 This page comes from a manuscript music book that belonged to Susanna Perkins (later Susanna Howard) of Bridgewater, Massachusetts. The book is dated June 20, 1786 and includes 68 sacred and secular pieces. This part book for Soprano includes compositions by many New Englanders, such as William Billings, Lewis Edson, Daniel Read, Jacob French, and Timothy Swan. 271968. AAS. Piano: Reels, Clogs, Hornpipes, Jigs. Vol. 1. By George W. Allen. 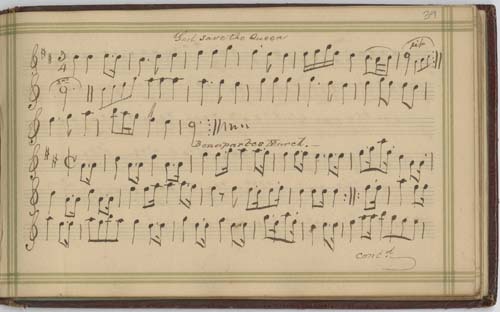 This page from a handmade music manuscript book with stiff board covers that are bound with string, it contains 128 tunes arranged for piano that have been attributed to George W. Allen. 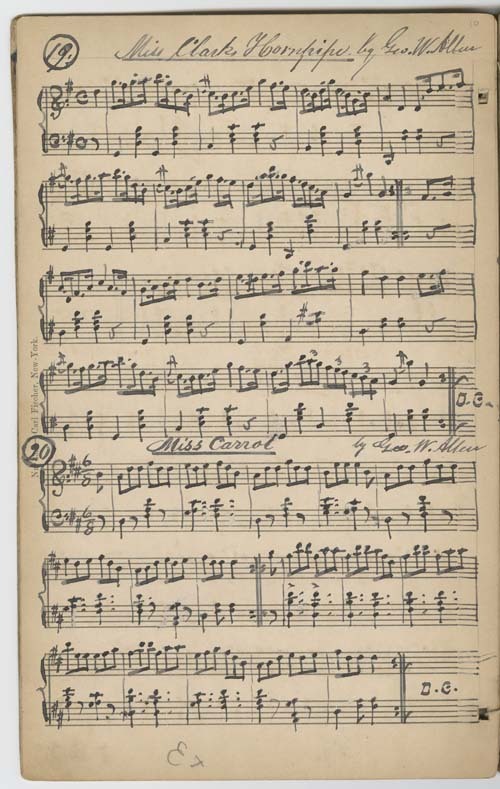 Although no date has been written on the item, several pages in the volume are preprinted music pages published by "Carl Fischer New-York," a company that began publishing music in New York in 1872. MUMSS-00087. CPM. The Oar Knob Song. 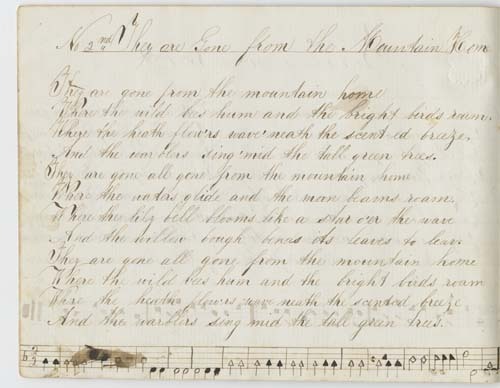 This manuscript page includes lyrics to the "Oar Knob Song" or the "Ore Knob Song," and references a mine disaster possibly at Ore Knob Mine in Ashe County, North Carolina. The song is written in pencil on lined ledger paper, and inscribed, "Rote June the 27th: 1879, James M. Wilson." Another inscription on the back of the page shows that it was addressed to Bettie Calloway of Grayson County, Virginia, and was likely sent as a letter. MUMSS-00152. CPM. Manuscript Music Book Belonging to William H. Clark. This musical copybook is inscribed "Wm. H. Clark, Hudson, New York." It has 85 pieces, including many Scottish dance tunes with Gaelic titles and popular songs such as "God Save the Queen." In this item and several other volumes within the collection, someone has repurposed the volume and added additional songs starting from the back forward. MUMSS-00074. CPM. Tell Me My Heart. 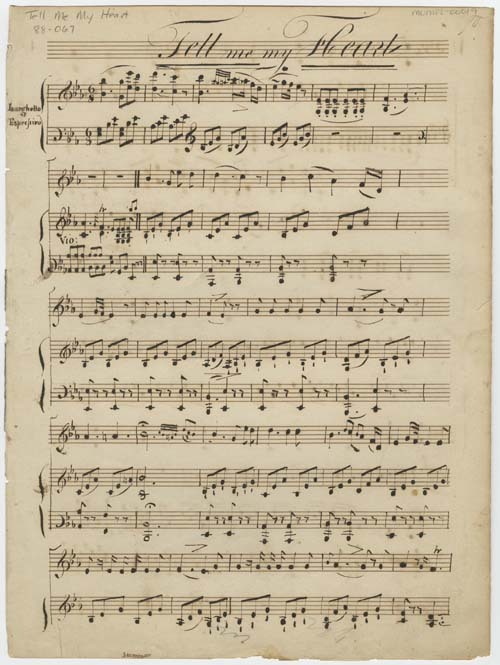 A piano score for the song "Tell me my heart," this item consists of four pages of manuscript music that have been removed from a larger manuscript book. Unfortunately, no ownership or other identifying information can be found on the item, and provenance cannot be determined. MUMSS-00019. CPM. Letter to Benjamin Glover. A letter to Mr. Benjamin Glover of Cutchogue, Long Island from Mr. Henry H. Terry. 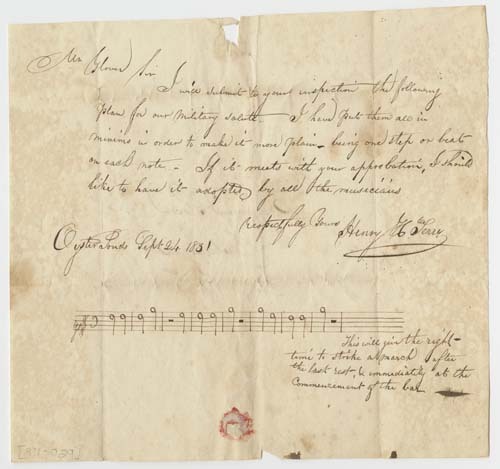 The letter includes music for a military salute. MUMSS-00007. CPM. The Farmer's Song. 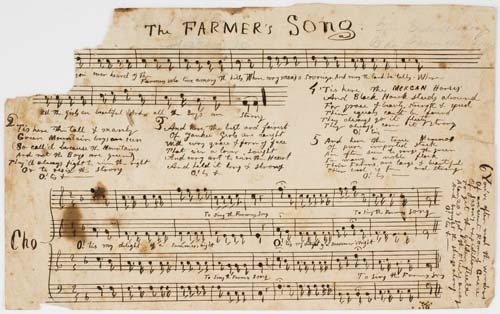 This single sheet from around 1835 includes music and lyrics for six verses of "The Farmer's Song" in four-part harmony. Inscriptions on the verso of the leaf read, "Betsy A. Stickney, George Stickney" and "West Drummerson, Vermont." 479487_octvol15. AAS. Florae Memoriae. From a music manuscript with two volumes, this page includes a unique illustration presumably by the owner of the manuscript. In addition to 84 pieces of music, the item also includes ornate title pages for each volume with colorful illustrations of flowers. Each volume is dated 1825 and is inscribed "L.H. Baker." 479487_fovol06. AAS.